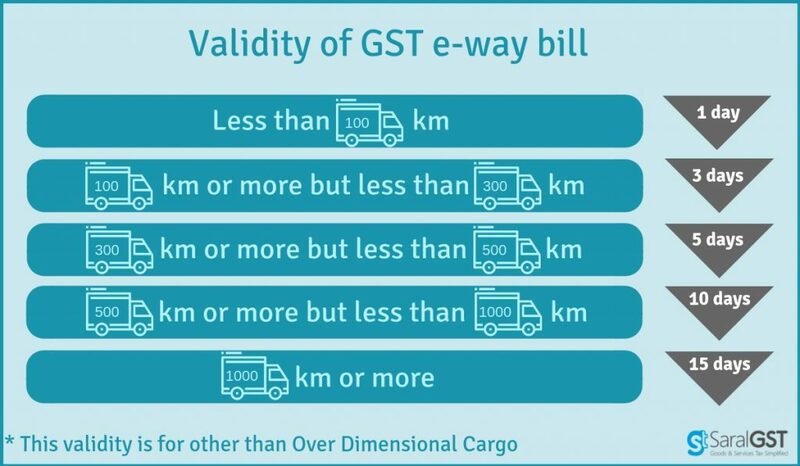 E-Way bill is an electronic document for the movement of goods from a supplier to the recipient. This document is generated at the e-way bill common portal. This document will be provided on the transport of goods which has a value more than Rs. 50000/-. It is mandatory that a registered dealer has to transport the goods with an e-way bill. A unique E-Way bill number (EBN) is assigned during the generation of an E-way bill. This EBN will be available to the supplier, the recipient, and the transporter. The person in charge of transporting the goods has to carry a document during transportation. One e-way bill for movement of the goods throughout the country. Hassle-free movement of goods for transporters throughout the country. No need for Transit Pass in any of the state. Easier verification of the e-way bill by officers with complete details. The traders need not visit tax offices anymore. Scope for corruption eliminated in the office or at check-posts. Environment-friendly – nearly 50 tons of paper saved per day. Officials saved of repetitive work and could devote time to analytical work. 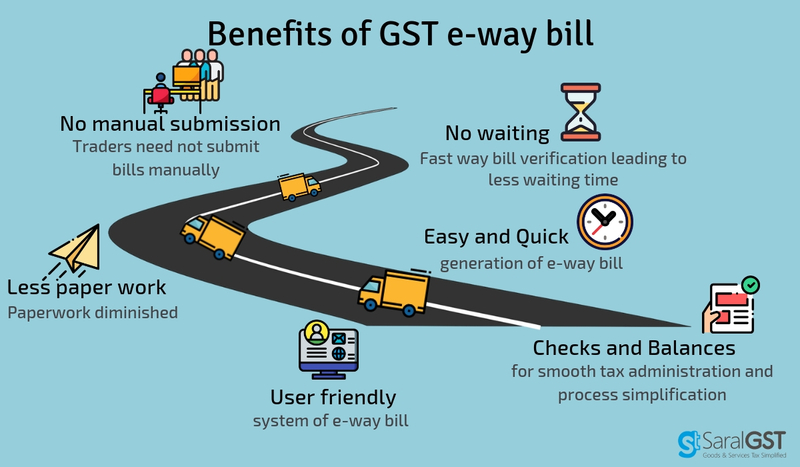 Once the supplier generates the e-way bill with all the details on the common portal, then it will be available to the recipient. The recipient will then communicate his acceptance or rejection of the goods under that e-way bill. Also, this is available only to those recipients who have a registration on the portal. If the recipient does not communicate the acceptance or otherwise within 72 hours of EWB generation, it is considered to be accepted by the recipient. An E-Way bill is valid for periods as listed below, which is based on the distance traveled by the goods. Here, the period of validity shall be counted from the time at which the EWB has been generated and each day shall be counted as 24 hours. However, Commissioner may extend the validity period only by way of issuance of a notification for certain categories of goods which shall be specified later. Also, if under circumstances of an exceptional nature, then the goods cannot be transported within the validity period of the EWB, the transporter may generate another EWB after updating the details in Part B of FORM GST EWB-01. Goods can not move once the validity expires. Invoice/bill of supply/delivery challan or Invoice reference number generated on the portal has to be carried by the transporter during transit. RFID readers will be installed at places meant for verification. Physical verification also will be done by the authorized officers. On receipt of specific information of tax evasion, physical verification of a specific transportation shall be done after obtaining necessary approval of the Commissioner or an authorized officer on behalf of the Commissioner. A summary of verification report of every inspection of goods in transit has to be submitted within 24 hours of such verification in FORM GST EWB-03 (PART A). Final report of such verification should be submitted within 3 days of the inspection in FORM GST EWB-03 (PART B). Once physical verification is done, then no further verification in the state shall be done provided any specific information on transit is reported. The facility is provided for uploading information regarding detention of vehicle i.e., where a vehicle has been stopped and taken into custody for a period exceeding thirty minutes. The transporter may upload the information in FORM GST EWB-04 on the E-Way Bill common portal. This ends our post. Let us know your opinion on this post by commenting below. Related: E-way bill generation process through Eway bill portal.